Back in the day, the Romans conquered Scottish territory only to decide it was too cold and too barbaric to govern. Their loss. Today, Scotland is renowned for its rugged beauty, dark medieval history and rebellious nature, luring millions of visitors each year. We're exploring the capital city of Edinburgh: a striking cityscape with both architectural elegance and dramatic, rolling hills. This time we're joined by two local guides, Colin Mairs (Excursion Scotland) and Sabela (Weekend Student Adventures), to share about Scotch whisky, Harry Potter inspirations, legends of Edinburgh's chilling past, and key highlights you can only experience in "Auld Reekie". Intro: Gear Up for your Adventure | After spending the last six years living all over Europe and running my young travel company, I want to share a handful of insider tips picked up from a life on the road. So you’ve decided to make the best decision of your life by studying abroad? Bravo! Whether you will be eating endless gelato in Italy, exploring the rainforests of Costa Rica or basking in the sun in Australia, those four months will be unforgettable. So now it's time to prepare yourself. How do you even begin such a daunting task? Well, here is a list of 15 tips to consider before flying to your new home away from home. Whether you’re planning to travel to Europe or are just a lover of all things European, movies are the best way to temporarily transport yourself to another place and get excited for the sights you may soon see in the flesh! 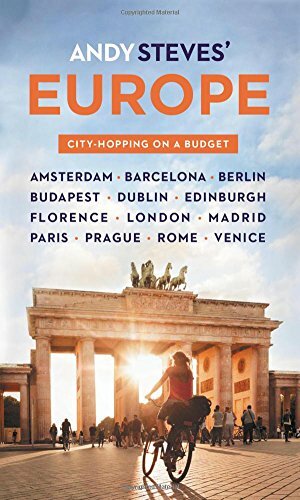 Here’s a list of the top movies to inspire your European wanderlust (and a few extras with some great European scenery). Europe is named after a Phoenician princess called Europa; she was seduced by Greek God Zeus when he disguised himself as a bull. Check out this list of 21 bizarre facts about Europe that have been put together in this awesome infographic! Blisters? These are the Traveling Socks for You! I love these double-layer Wrightsock socks to avoid blisters while traveling, spending long days on my feet. Fall and Spring Wool Socks? Check these out! I love these lightweight wool socks to travel with in the shoulder season to keep those toes warm! Newer PostS2 E0 - S2 Preview, We're Back! Join the travel troupe! We'll send episodes & latest budget tips regularly (but not too regularly). You may unsubscribe at any time. Start with Andy's latest tips here.